Scientists in Australia recently reported that the country’s Great Barrier Reef has lost 50% of its coral in the last 27 years. Most of the damage has been caused by strong storms that have hit the area and by a coral eating starfish called crown-of-thorns. A smaller percentage of the damage has been caused by the rising ocean water temperature. It’s not possible for the scientists to control the storms or the water temperature. However, scientists might be able to decrease the population of the coral chomping starfish in the area. Here is an image of a Reef before and after a cyclone hit the area. The Great Barrier Reef is the world’s largest coral reef system made up of around 3,000 reefs covering an area of about 1,400 miles (2,300 km) off the north eastern coast of Australia. In fact, it is so large that it can be seen from space. A coral reef is a structure in the water made by tiny animals that live in colonies in the water. 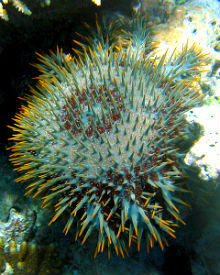 The crown of thorns is the second largest starfish (sea star) in the world. The sunflower seastar is the largest. Here is a video on the Great Barrier Reef.